Oshawa’s Development Services committee has given tentative approval to a development in the city’s south end. The subdivision is one of two proposals that saw residents fill the council chambers in protest in 2017. A development proposal for a patch of land in the city’s south end that has seen strong blowback from the local community is one step closer to approval after getting unanimous support from councillors at the committee level. At the meeting of Development Services on May 7, a subdivision proposal for nine buildings consisting of 56 town homes on the corner of Phillip Murray Avenue and Park Road South was given approval by councillors after more than a year of back and forth between the City of Oshawa, Graywood Developments and General Motors. 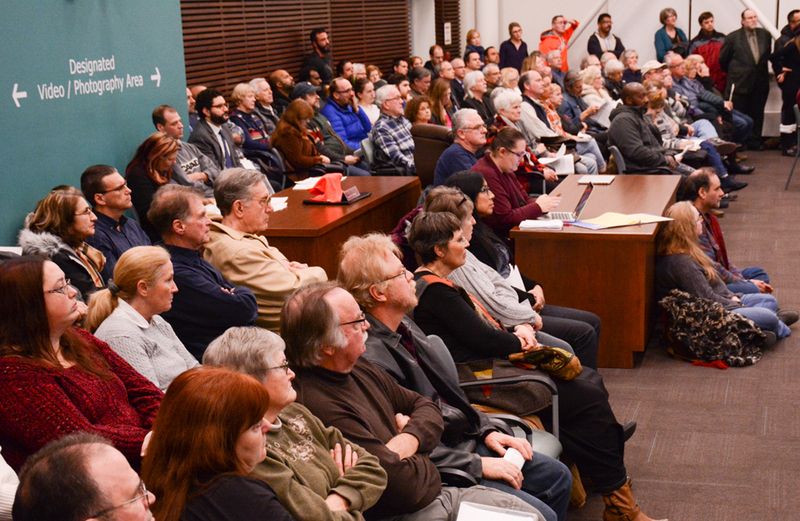 The proposal was initially presented in January of 2016, when throngs of residents filled the council chambers to share their disdain for the development along with a secondary subdivision proposal from the same developer for a chunk of land adjacent to Lake Ontario south of Renaissance Drive and west of Park Road South. That proposal is now before the Ontario Municipal Board following an appeal from the developer. The city has already stated publicly they are opposed to that development in its current state. During the recent meeting, residents shared their hopes that the city would take a similar stance to the proposal at Phillip Murray Avenue and Park Road, as concerns still existed around traffic congestion in the area, as well as services for the people who would eventually move into the area. “There’s no community support for this change,” said resident and former councillor Brian Nicholson. Recently, an appeal to the OMB on the proposal was pulled back by the developer, a decision that had residents and councillors confused. “It is quite unusual that they would do that,” said Councillor Dan Carter. The move is an unusual one as it puts the decision on the proposal back in the hands of council and eliminates the developer’s chances of taking their case to the OMB should council have turned it down. If denied, it would follow the new land tribunal process implemented earlier this year. “It’s very risky,” says the city’s commissioner of development services Paul Ralph. The move had residents questioning whether the developer was given some form of indication that city staff would be recommending to council that the proposal be approved. According to the staff report recommending the approval, many of the previous issues with the proposal, including those raised by General Motors, whose General Assembly abuts the property, had been worked out. Ralph denies that any word of staff’s decision was given to the developer ahead of them rescinding their OMB appeal. “The developer withdrew its appeal to the OMB on its own volition, staff did not recommend that at all, they did it on their own,” Ralph says. The final vote on the proposal will go to council on May 22.